For eight years, America‘s most elite secret warriors have tirelessly worked to kill terrorists. But they’ve also been quietly saving lives in muddy camps here, where hundreds of thousands of homeless have pitched tarps and tents. Troops who for years hunted Al Qaeda suddenly made unlikely temporary alliances with Cuban Communists or Doctors Without Borders – even Hugo Chavez pal Sean Penn – to coordinate aid to quake-battered Haitians. Nearly six weeks after the Jan. 12 earthquake killed 217,000 people and left more than 1 million homeless, the desperation has barely abated. There is still little running water, sanitation, electricity or reliable phone service in this city of 2 million. The stench of death and the piles of bloated corpses are gone, but Port-au-Prince still looks as if God put his thumb on the poorest city on Earth. Entire neighborhoods were felled like sandcastles in the surf. Long lines for food and water remain. But the U.S. military mission is now winding down. International relief services are stepping in. “We’re beyond the catastrophe stage – we’re at the stage of improving what we’ve got,” said Lt. Col. James McFadyen, an 82nd Airborne commander. That’s a sign of success, commanders say, for the masters of chaos sent here after the quake: Navy SEALs, Air Force Air Commandos, and Army Green Berets, Rangers and paratroopers. These veterans of classified counterterror missions are known for their smarts and cultural sensitivity. “Things tend not to surprise us,” Army Col. Barrett Lowe, deputy commander of U.S. Special Operations in Haiti, told The News. 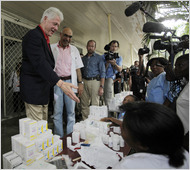 Former President Bill Clinton, who is the United Nations special envoy to Haiti, returned here on Friday to meet with government and aid officials, visit a health clinic and deliver medical supplies, computers and generators. Mr. Clinton praised the progress being made in the relief effort, especially in addressing the need for food, shelter and security, but he expressed a growing sense of urgency about the country’s requirements for sanitation and health care. Mr. Clinton was given the added responsibility on Wednesday of overseeing United Nations aid efforts and reconstruction in Haiti after the magnitude 7 earthquake that devastated Port-au-Prince, the capital, and surrounding areas on Jan. 12. United Nations officials echoed the concerns over sanitation and health. If he is serious…he’s got a big job ahead of him…….. The future……Haiti will be rebuild…..in what image? While the reports in the media is of getting supplies and aid to the living…..and the concern on the ground inevitably begins to turn to recovery…..the politicians…such as Secretary Hillary Clinton and others must turn to Haiti’s future…..as a country vanquished by tragedy…Haiti will have to be rebuild.…not discarding what being dealt with right now…but decisions…even at this moment, have to be made for the countries future…..